Himaland Adventure Treks P. Ltd is a local Nepal and Tibet expert for organizing holiday package trips – local culture experience tours and soft adventure over last 17 years. It is government registered affiliated with and active members of Trekking Agencies’ Association of Nepal (TAAN), Pacific Asia Travel Association (PATA), Nepal Mountaineering Association (NMA), Nepal Canyoning Association (NCA) and Sustainable Tourism Network (STN) under Nepal Tourism Board (NTB). Both - our clients and competitors are well impressed by Himaland’s professional and personalized service. Himaland service is recommended by ALPIN, a popular Alpine magazine in Europe, Polyglott travel guidebook, Polyglott – Verlag München, Ministry of Foreign Affairs, Nepal and products are approved by Get Your Guide. 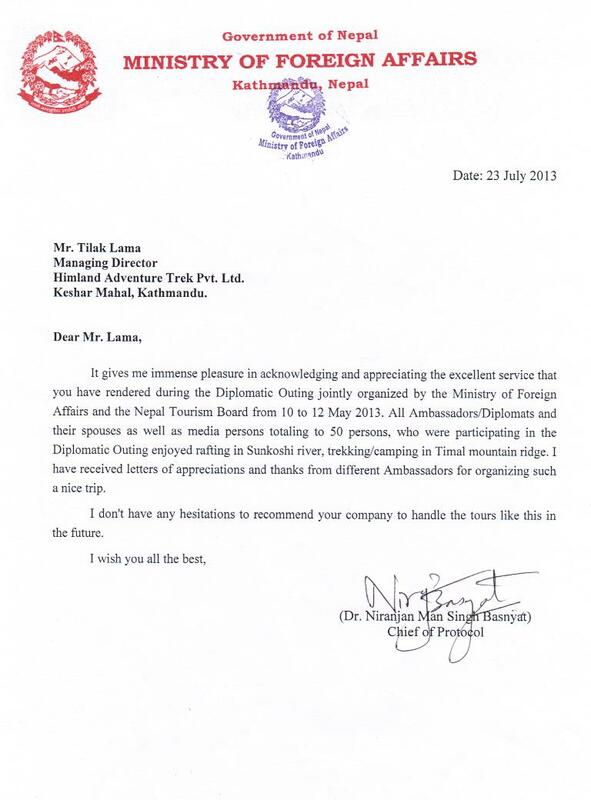 Also ITB, Berlin Germany has awarded Himaland 'Certifictae of Appreciation'. All founder directors; Tilak Lama and Dilli Gurung have proven records of achievements in organizing treks, tours and other special interest package trips + office management in their uninterrupted career in travel and tourism fields. All our field staff and guides are trained and certified. The Himaland team is well organized with a perfect combination of 25 years long working experiences and high academic & management knowledge led by Tilak Lama. As a result, the Himaland as a company is well known for professional and personalized service for over a decade. The Himaland team has been providing professional and personalized service organizing trek and tour package trips to the Western clients mainly from Europe and the USA. As a local expert based in Kathmandu, our main trips are in Nepal and also in trans Himalayan region, Tibet and Bhutan. Himaland to be a leading socially responsible trek/tour operator catering quality service with sustained growth in terms of sales volume and market base with solid foundation of happy clients.